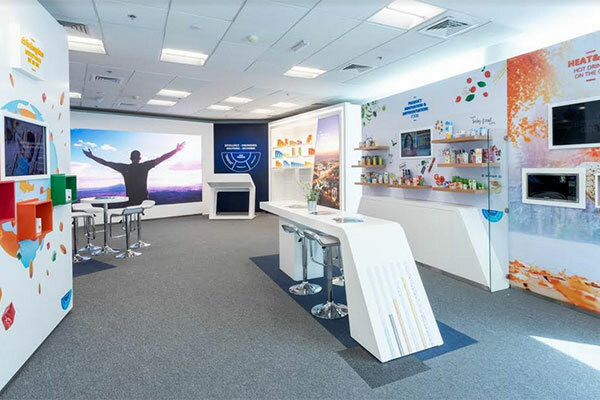 A new innovation centre has been unveiled in Dubai, UAE, marking a revolution in the way food and beverage products are packaged and delivered to customers. The Innovation and Reliability Centre (IRC) at SIG Combibloc Obeikan (SIG CBOB), one of the world’s leading suppliers of carton packaging and filling machines for food and beverage, was officially opened in Dubai Silicon Oasis by Abdallah Obeikan, CEO of Obeikan Investment Group and Rolf Stangl, CEO of SIG. The IRC has been created for SIG CBOB customers to adapt to the seismic shift in the F&B production and consumption market, and the rapidly changing behaviour and expectations of consumers by delivering solutions which combine state of the art technology, connectivity and smart packs. “This ensures we consistently provide end-to-end solutions that add real value for our customers now and in the future. We have developed three segments that speak to the core challenges of our customers – product innovation and differentiation; connected packs; and smart factory. “This framework allows us to express who we are as a company today. And, more importantly, the value we bring to our customers and consumers, demonstrating our core capabilities and the solutions we provide,” he added. A partnership with technology leader GE comes sharply into focus at the centre, providing some of the best solutions designed to optimise plant operations and increase efficiency. Customers visiting the IRC will be able to see the latest innovations in sustainable aseptic packaging such as a carton pack that can be heated and carried on the go, a carton pack that acts like a bottle, and the world’s first aseptic pack 100% linked to plant-based renewable material. The first of its kind in the world, the Reliability zone of the centre monitors and evaluates the performance of all SIG CBOB’s lines across all clusters, enabling remote service. Martin Schmedes, Marketing & Strategy director MEA for SIG CBOB added: “The creation of the IRC is in direct response to a range of key production demands, such as the leverage of connectivity between information technology and shop floor operations, the adaptation of production processes for each product, quickly and efficiently, and the optimisation of overall equipment effectiveness and the reduction of operational costs. The opening of the IRC coincides with SIG CBOB’s participation in Gulfood Manufacturing, running until 8 November at the Dubai World Trade Centre, where visitors are able to see their differentiated product designs, smart filling plants and digitally interactive packs. The company is using the event to unpack the perfect package by combining state of the art technology, connectivity and smart solutions for their clients and ultimately, the consumer.